Why its important to remember that siblings grieve too. It is said that when your parents die, you lose your past. When your child dies, you lose your future, however, when your sibling dies, you lose part of your past, your present, and your future. November has been worldwide bereaved siblings month. A bond that is unique and irreplaceable, siblings are best friends, someone who knows you in a way that no one else ever will. Many say that sibling grief has been overlooked in literature on bereavement, often referred to the ‘Forgotten mourners’. People tend to console the parents, friends, and children (if any) of the person who died, before thinking about their siblings. At Edward’s Trust we know just how devastating an effect unresolved grief can have on a person, even more so on a child or young person who is not supported and taught methods to express their emotions and come to terms with their grief. Losing a sibling not only alters your life completely but it can change who you become as an adult, therefore receiving that support is vitally important. It is so important that we remember that siblings grieve too and that they need just as much support as the rest of the family. Something that 11 year old Louie Wright knows all too well. When Louie first came to Edward’s Trust after losing his much awaited baby brother, Billy at 12 days old, he had no interest in anything. He was angry, upset and worried about his mom and dad. The support Louie has received from Sue Dale, one of our children’s counsellors, has helped him to deal with the loss of his little brother. Louie is now calmer, less upset and happier to talk about Billy. During sessions Louie created a memory jar, using chalk he coloured layers of salt each one representing a different treasured memory with Billy. Along with his memory jar Louie used paints to create a picture which represents a dream world for him and Billy. 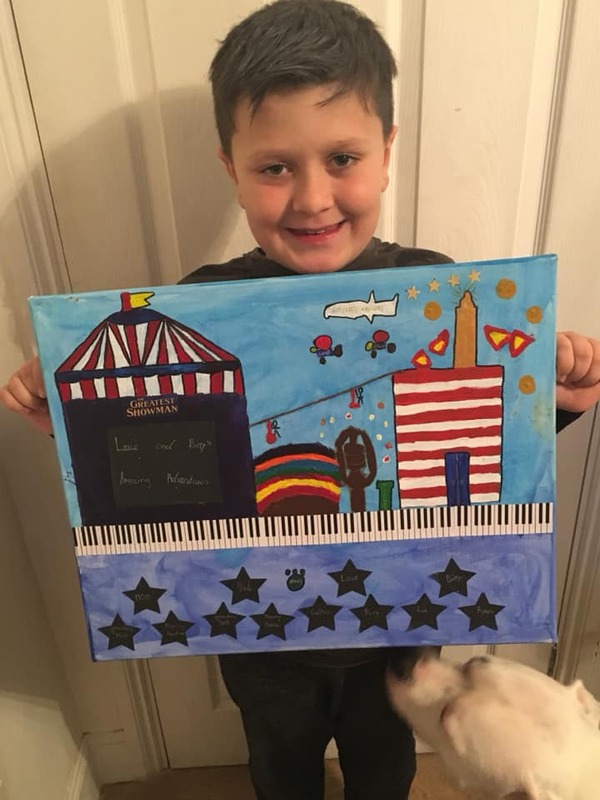 Louie was having a lot of bad dreams when Billy died and this painting shows all the good dreams that Louie has for him and Billy and all the wonderful things they would do together in this dream world. Louie can now look at this and use it whenever he is missing his brother or feeling low. “Louie was a very frightened and angry little boy when he lost his much longer fro little brother Billy. He lost interest in everything he used to love and felt like he had nothing to look forward to. Then he started seeing Sue at Edward’s Trust, she taught him how to deal with his grief whilst still remembering his little brother, he is like a different child now! He now enjoys life again and knows that it is ok to have fun. Thank you ET for everything you have done for Louie” Louise Wright, Louie’s mom. Benn’ys Hat by Juliet Clare Bell is a touching story that follows Friz’s from when she first learns of her brother’s illness, right through to his death and beyond. With its realistic but hopeful and gentle tone, readers will see that it is normal to feel a whole range of emotions –sad, worried, confused, angry and happy, even during the darkest of times. The story not only gives a view into grief and bereavement from the view point of a young sibling but it is also useful for adult readers as it gives examples of how to support children when a sibling has a terminal illness and after they have died. These examples are provided through watching Friz’s parents’ reaction to her behaviour and the notes pages at the back of the book. These pages, titled ‘A note for parents’, were provided by our children’s counsellor Sue Dale. Using examples from the story for questions, discussions can open up and allow the child to talk about their own feelings regarding the death or upcoming death of their sibling. Some of the activities mentioned include creating a ‘memory jar’ as a way to represent special memories, something that is done with a lot of our children during their sessions at Edward’s Trust, and creating an ‘internal first aid kit’ which is another good way to help children to encourage them to think about and access positive coping strategies. These tips on talking about Benny’s Hat with a child and activities for parents/careers to try provide useful methods of exploring the child’s feeling during this difficult time.